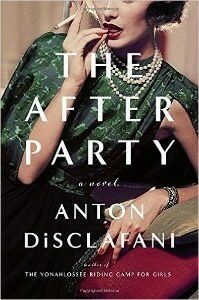 I would love to climb into Anton DiSclafani’s mind, because I suspect it’s a dark, warped, and slightly dirty place. And I mean that in the best way possible. Much like her first novel, The Yonahlossee Riding Camp for Girls, DiSclafani’s The After Party slyly and glamorously deconstructs the concept of “bad girl.” DiSclafani gives us a young woman who doesn’t quite fit into societal conventions—a young woman who might be a hot mess or might just be ahead of her time. Or both. Or neither. We don’t get a straight answer from DiSclafani, but she writes so seductively that it’s a thrill to keep guessing. But The After Party dishes up a lot more than this luxurious and remarkably shallow time and place. The book becomes a sort of tormented love letter from Cecilia Buchanan to her best friend, Joan Fortier. After growing up together, 25-year-old Cecilia cannot grasp why their relationship has changed—and what sordid secrets Joan is keeping from her.